This isn't the first time Rhett Reese and Paul Wernick have worked on anti-hero comic book screenplay. The duo were previously pegged by Sony to write a "Venom" script. Sony later passed on their vision, but now 20th Century Fox intends for them to bring the type of hilarity they wrote in Zombieland to the Merc with Mouth, Deadpool. As of right now there is no set timetable for "Deadpool." Ryan Reynolds will be shooting "The Green Lantern" through summer, after which would be the first opportunity for "Deadpool" to begin. Of course this is all banking on Reese and Wernick have a working script ready by then. The duo have also been pegged to write a 3D follow up to Zombieland. 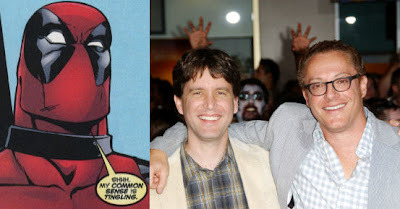 Rhett Reese and Paul Wernick in theory are the perfect guys to bring the Deadpool brand of humor to the big screen. They did a knock-up job with Zombieland outside of a few pitfalls in the third act and have me intrigued to see what they come up with for Deadpool. It also helps that the writing duo know who the talent is. Understanding that Ryan Reynolds will be delivering the dialogue, Reese and Wernick know full well they can pen some quality dialogue ripe for Reynolds to nail.